One of the many species of sea turtle which campers learn about at Sea Turtle Camp is the green sea turtle (Chelonia mydas), which is listed as either a threatened or endangered species around the world. However, this species still nests in large numbers here in the United States on the east coast of Florida and in the Hawaiian Islands. Green sea turtles have an olive brown to black colored carapace with a yellowish colored plastron (lower shell). They get the name “green turtle” from the green colored fatty tissue under their shell, which is used to make turtle soup. Green turtles are the largest of the hard-shelled turtles, weighing up to 500 pounds! They are easily distinguished from other sea turtles because they have only a single pair of pre-frontal scales between their eyes rather than two pairs like the other species. Green turtles also have a small head and special serrated beak to help them eat. Just like manatees, green sea turtles are large grazing marine herbivores. As juveniles they are omnivorous, eating both plants and animals, but as adults, they eat nothing but sea grasses. A favorite is Thalassia testudium, commonly called turtle grass. 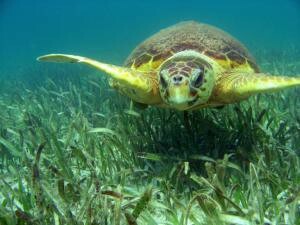 It is thought that because green sea turtles consume a diet of sea grasses, as opposed to the fishy diet of other species, the meat of green turtles is softer and has a better taste for preparing foods such as soup or steak (both of which are illegal to eat in the U.S.). 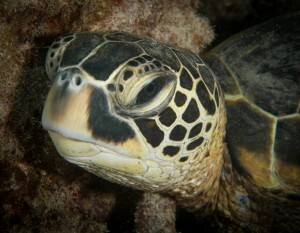 Because these turtles are found worldwide, it is difficult to generalize their nesting cycles, but in the U.S. Hawaiian Islands, adults undergo their long journey from their feeding grounds in the main Hawaiian Islands to their mating and nesting grounds in the French Frigate Shoals (the Northwestern Hawaiian Islands) between May and August. 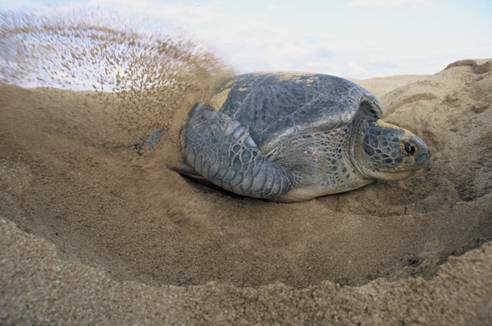 Green turtles nest in intervals of 2, 3, or more years and lay an average of 3 to 5 clutches per season. Nesting season runs from June to October in the U.S. The largest nesting site in the western hemisphere is in Tortuguero, Costa Rica! Join us this summer in North Carolina, Hawaii or Costa Rica to learn more about the world of sea turtles!